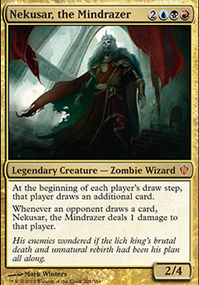 Each player shuffles his or her graveyard and hand into his or her library, then draws seven cards. You untap up to six lands. Remove Time Spiral from the game. 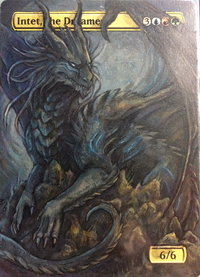 @Nycthemeron, thanks for the feedback! We added Paradox Engine after a bit of discussion. Alongside it's great combos with Scepter, it serves as an excellent way to repeatedly draw with Looters. 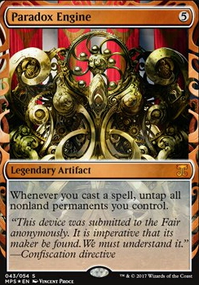 This might enable us to occasionally churn through our deck. 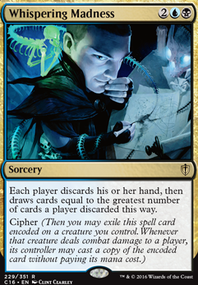 It gets even better with Kefnet out, as the sequence of "Loot, Copy, Cast, Untap" is pretty potent, even if it might not be game-winning. We cut Expropriate to accommodate it, as we felt that three extra turn spells should be enough. Expropriate is also just too damned expensive to cast. We both think that Timetwister is spectacular, if a tad pricey. 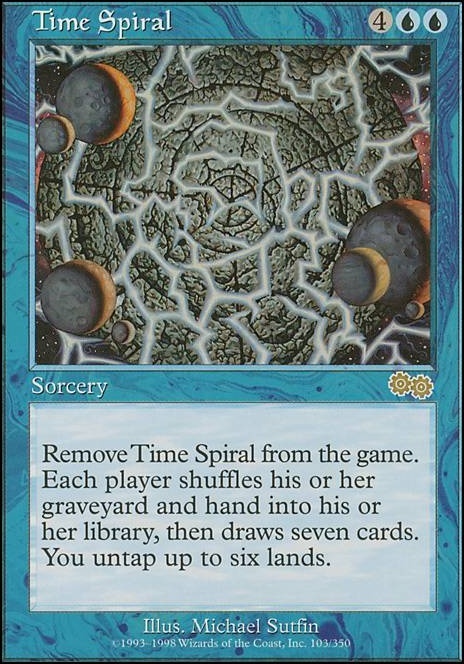 Time Spiral just isn't a very castable card, even if it might allow us to do some gross things. And the difference in (mana) cost, with or without Kefnet copying it, is significant. So we've made that change as well. In addition, a good number of cards have been swapped around. We think the deck looks better now. Still lots of room for improvement. Finale of Revelation Draw X cards. If X is 10 or more, instead shuffle your graveyard into your library, draw X cards, untap up to five lands, and you have no maximum hand size for the rest of the game. Oh, totally read the card wrong! I also found Wheel of Fate , and if you are off budget maybe Wheel of Fortune and Time Spiral as some efficient wheeling effects! And last but not least, Keep Watch would be an amazing addition to the deck! Hope you see some interesting stuff! irotpigs Yes! 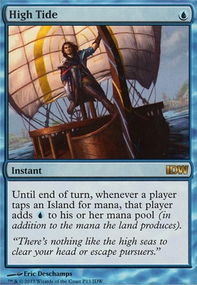 The primary win condition is decking everyone with Blue Sun's Zenith but when that isn't an option (like if it has been removed from the game) the alternative way to win is by using Stroke of Genius , shuffling it in with Time Spiral , re-drawing it, casting it again, and recurring it with Snapcaster Mage for the third time to deck everyone. Um.. that's an interesting question. Theoretically, it's possible to generate infinite mana with Paradox Engine and our mana rocks, which can be dumped into Blue Sun's Zenith . Also, Timetwister and Time Spiral shuffling Stasis back in to try again is an option. Milling someone naturally is also a very valid option. If you were to build and play this deck, I highly recommend not scooping if/when one of the combo pieces is countered. Play with your draw. You can outlast your opponents through counters and card draw. ShotgunCrocodile: Stifle works, but more importantly Firestorm just outright WINS with counter backup, and can be cast off of Simian Spirit Guide (as zrob noted). MVP12: I tested both him and Mission Briefing here, but honestly my GY is often surprisingly empty. Many of my wheels either shuffle in the GY (for example, Timetwister ) or exile themselves to prevent re-casting ( Time Spiral etc). Honestly, they just never had the impact I wanted in a combo deck - they're better in a grindy tempo-control deck than here. I do not have Time Spiral & Timetwister & Transmute Artifact . 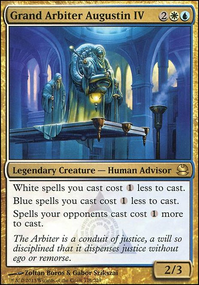 Should i remove Personal Tutor since it's only interest is in this configuration to seek for Creature removal or other tutor ? Thanks you for your list and your help !